Behold! Their Royal Highness Chocolate Chunk Cookies are here. They deserve the best cookie jar to live in, and the coldest glass of milk to be dunked in. These cookies are so good they seriously deserve to be called royalty. I’m not kidding. See, I’ve met a lot of cookies in life. Some were too crunchy, some too sweet. Some didn’t have enough chocolate in them, and some were as dry as sand paper (very unfortunate). Some were too cakey, and some were as hard as rock (cue, visit to the dentist). But these cookies. These COOKIES. Sorry for yelling. But these cookies are the best soft and chewy chocolate chunk cookies in the whole wide world. These are the kind of cookies that will be with you in thickness and softness. In chocolate-ness and in buttery-ness. In happiness and sadness. These cookies will be your best friends forever. Just look at these cookies. They have big pockets of melty chocolate everywhere. Refer below to see the seriously melted chocolate pockets. Do you still need more convincing to make these cookies? 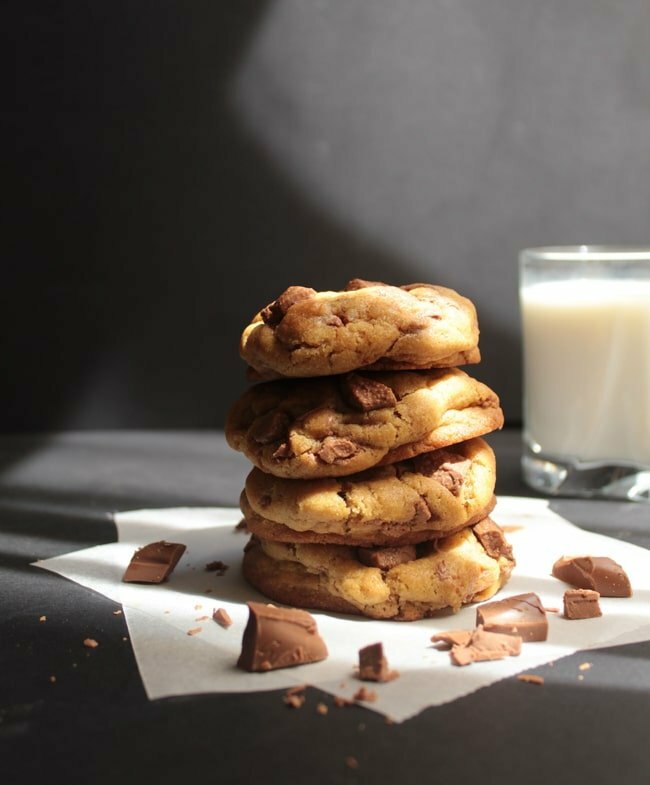 They are so thick and chocolatey that you need to pair them with cookie’s best friend: a cold glass of milk. Also, they are made without a mixer. Just two bowls needed. And just 15 minutes of prep work. 2 hours of chilling time (the cookies chill in the fridge, and you chill in front of the TV). And 10 minutes of cookie baking. After which these cookies are yours and only yours to be devoured. With a cold glass of milk, obviously. Did I say that before? These are the kind of cookies that you can bribe people to do as you bid. Seriously, I’m not kidding. Just hand one of these to a toddler and they’ll stop throwing dramatic tantrums on the floor (not that I would ever resort to bribing with cookies…or maybe I would). Give one of these to your siblings if you don’t feel like washing the two bowls you used for making the dough. They’ll be so under the spell of these super soft, thick and chocolatey cookies that they’ll happily wash the dishes. And just in case if they do refuse to do the dishes, just threaten to eat all the cookies by yourself. They’ll give in. Give one of these to your husband when you’ve accidentally scratched the car while parking. Or maxed out the credit card while on a shopping spree at Sephora. He’ll forget all about it once he bites into the cookie and is transported to cookie heaven. So in a way these cookies are a life saver. That also makes them noble cookies along with being royal. That makes them cookies worthy of your time. Now go to the kitchen and make these cookies. You need them in your life for deliciousness. 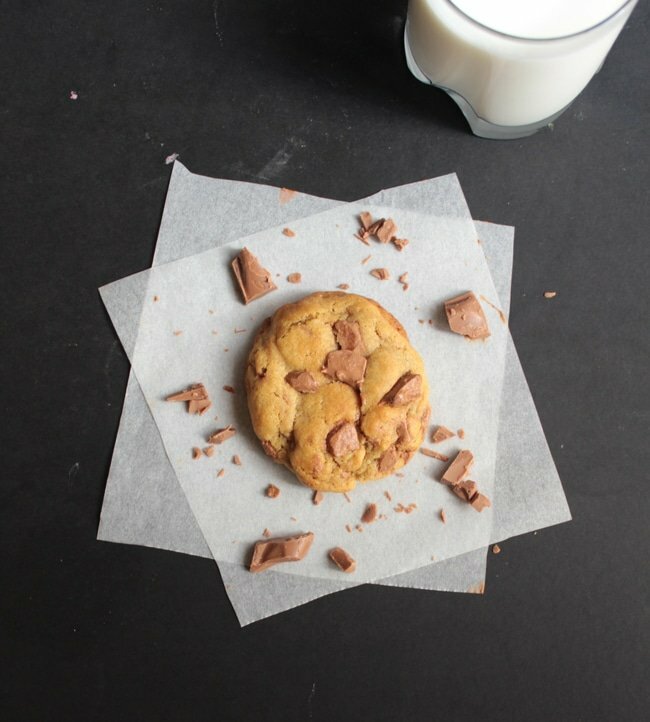 Deliciously chewy and soft chocolate chip cookies. 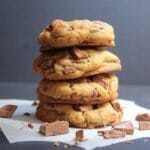 You will never need another cookie recipe again! In a large bowl combine the dry ingredients: flour, baking soda, cornflour and salt. Set aside. In another bowl using a wooden spoon mix the melted butter, light brown sugar and granulated sugar. Whisk until there are no brown sugar lumps remaining. Add the egg and the egg yolk. Mix with a wooden spoon until combined. Add in the vanilla extract. Finally add the chopped chocolate chunks and mix until just combined. The batter will be soft and thick. Cover the dough and place it in the refrigerator for at least 2 hours. After 2 hours take out the dough and let it come to room temperature. You can even put it in the microwave for about 5-10 seconds to just slightly soften it. But be careful not to soften the dough too much. Roll the dough into balls. Each cookie should be made from about 3 tablespoons dough. Line two baking sheets with parchment paper, and place 8 cookie dough balls on each baking sheet. Bake for about 10-11 minutes, or until the edges are light golden. To check if the cookie is done place a butter knife just under the edge of a cookie, if it lifts easily the cookie is done. The cookies will look very under done, but do not over bake. Let the cookies rest on the baking sheet for 10 minutes. They will continue baking from the residual heat of the baking sheet. After 10 minutes place them on a cooling rack to cool completely. *Recipe adapted from Sally’s Baking Addiction. This is just how I like my cookies.. nice and thick, soft and filled with chocolate chunks! 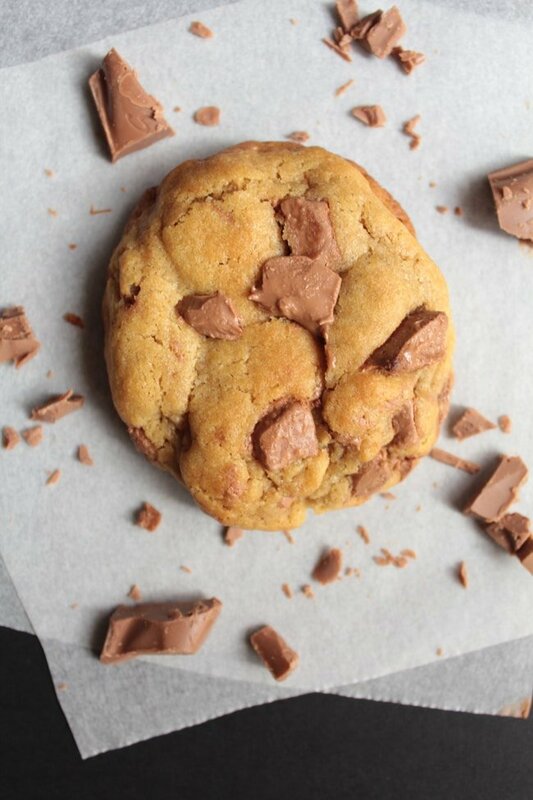 The only thing better than chocolate chip cookies is chocolate CHUNK cookies!! Yum! I know I wouldn’t be able to stop at one! I can tell just from looking at these cookies that they are exactly the right amount of soft and chewy. I love the thickness and I especially love the chocolate chunks! Needless to say (or should I say kneadless – sorry for the pun, couldn’t help it), these look incredible! These really do look big and chewy! These cookies look incredible! Sure come over Manal! ;) Thank you for the sweet comment! I am always on the hunt for softer, chewier chocolate chip cookies! These look so amazing! These look just delicious. I want to have one (or two) right now! These cookies look AMAZING. I love how thick they are! 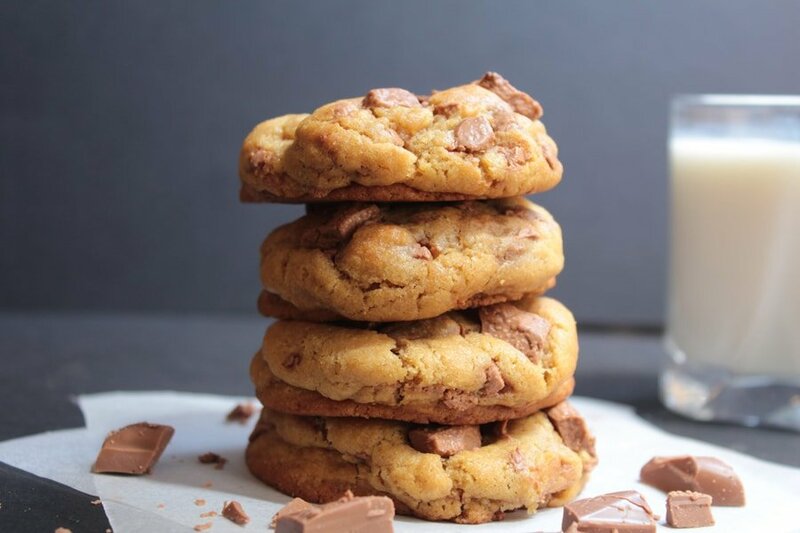 When I first set eyes on your thumbnail pic I was already in heaven, and then seeing them in full photo…hello The Best Soft Chewy Chocolate Chunk Cookies. It looks like you are right about that. I am definitely pinning these bad boys and will be making these cookies in the very near future. Thank you for making these and sharing! Also, I LOVE your blog name…too cute! 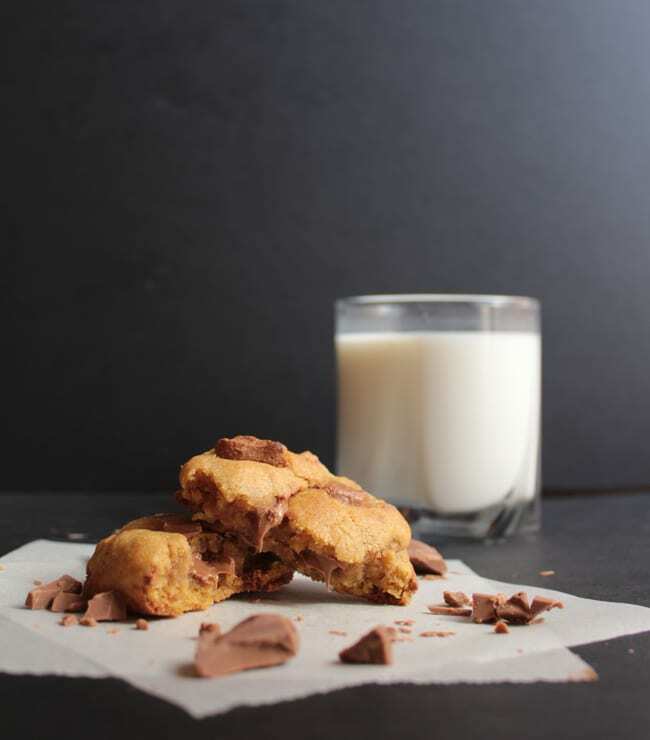 These are swoon-worthy – and now I’m craving chocolate chunk cookies and milk! Nothing better than a delicious cookie!!! These look SO good! I’m always on the hunt for the next cookie to try so I think I’ll give this a go this weekend! 🙂 Thanks a ton for sharing! These look so soft and yummy and I would definitely need a cup of milk to wash them down! These looked so good I had to make them right away! They’re a bit sweet for my taste and sadly they didn’t turn out exactly like in the picture (mine are flatter and probably less soft), but they’re still quite good. I mixed half the dough with milk chocolate and half with darker chocolate, surprisingly, I think I prefer the dark ones. These cookies saved my life. Thank you for bestowing this recipe unto me. I am unworthy of their beautiful texture, chocolate goodness and soft vanilla chewiness.